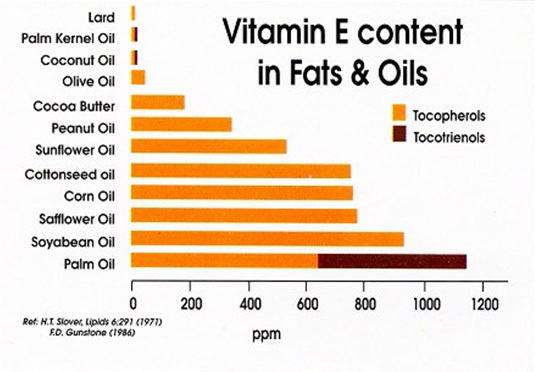 Vitamin E comprised of 2 subgroups namely the Tocotrienols and Tocopherols. Tocopherols are present in common vegetable oils such as soya and corn while tocotrienols are common in cereal grains such as rye (92mg/kg), oat (210mg/kg), rice bran (465mg/kg) and barley (910mg/kg). Tocotrienols are also in abundance in palm oil (940mg/kg). Palm oil also has the highest content of Vitamin E among oils and fats. Several studies have shown shown that tocotrienols possess unique biological properties including higher antioxidant potency and provides greater health benefits than the α-tocopherol form of vitamin E.
Many animal and human studies show that tocotrienols are useful against inflammation – associated diseases. Besides its function related to its antioxidant properties, tocotrienols also exhibits other biological properties including neuroprotective, anti-cancer, anti-inflammatory and cholesterol lowering effects. The potential of tocotrienols is vast and beneficial in many aspects; thus it could ideally be used as a first line therapy and clinical purposes. 1. Bryce Wylde, Consumer Perception And Pick-up: Where We Are At And Where We Should Be. Paper presented at the Palm International Nutra-Cosmeceutical Conference (PINC 2017), 31st July – 1st August 2017, Le Meridien, Putrajaya. 2. Dr. Sharmili Vidyadaran, Tocotrienols and their effects on microglia: implications for brain inflammatory conditions. Paper presented at the Palm International Nutra-Cosmeceutical Conference (PINC 2017), 31st July – 1st August 2017, Le Meridien, Putrajaya. 3. Prof. Dr. Ima Nirwana Soelaiman, Effect of individual tocotrienol isomers on bone cells in a 3D cell culture system. Paper presented at the Palm International Nutra-Cosmeceutical Conference (PINC 2017), 31st July – 1st August 2017, Le Meridien, Putrajaya. 4. Dr. Nur Azlina Mohd. Fahami, Palm Vitamin E: A Potential Therapy for Peptic Ulcer Disease. Paper presented at the Palm International Nutra-Cosmeceutical Conference (PINC 2017), 31st July – 1st August 2017, Le Meridien, Putrajaya. 5. Prof. Dr. Suzana Makpol, Tocotrienool Promotes Myogenic Differentiation in the Prevention of Replicative Senescence of Myoblasts. Paper presented at the Palm International Nutra-Cosmeceutical Conference (PINC 2017), 31st July – 1st August 2017, Le Meridien, Putrajaya. 6. Dr. Patrick Ling , Dissecting the Mechanism Responsible for the Anti-Cancer Stem Cell Properties of Gamma-Tocotrienol. Paper presented at the Palm International Nutra-Cosmeceutical Conference (PINC 2017), 31st July – 1st August 2017, Le Meridien, Putrajaya.